We enjoyed watching Rick Stein’s India TV series and tried his Lamb Rogan Josh recipe from one of the programmes. Its tomatoey with Kashmiri chillies, yoghurt and cream. 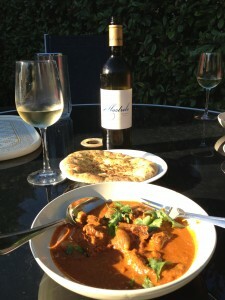 A lovely rich, smooth and spicy curry that we served with pilau rice and garlic and coriander naan. Bizarrely, we enjoyed this in the garden on a warm summer day. We paired the meal with a bottle of Albastrele Pinot Grigio Moldova 2011 from the Sunday Times Wine Club. 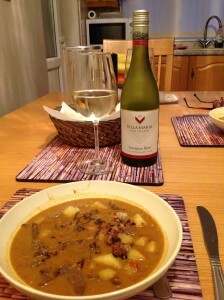 This white was creamy, mellow with pear and melon flavours and was a great match with the curry. We cooked a Supercook recipe, Tikkah Kabab – lightly spiced lamb kebabs, marinated in ginger, onions, coriander, lemon juice, green chillies and black peppercorns. We served them with chapattis and a green salad. To drink with the meal we chose a bottle of Villa Masetti Pinot Grigio 2011, an Italian white from the Sunday Times Wine Club. We found the wine to be fresh, crisp and fruity, with a lemony, grapefruit creaminess. 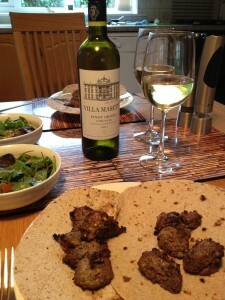 Whilst lamb is often better with red wine, this white was great with the spicy flavours in the kebabs. We cooked Masala Lamb Chops from Madhur Jaffrey on the barbecue. We used boneless. The meat is marinated in Indian spices for hours and the chops are grilled on each side after spreading with cream. We served the lamb with Bombay Aloo. The cream suggested a white wine pairing to us, so we went for a bottle of The Society’s Pinot Grigio from The Wine Society. We were surprised that the dish did this dry and fruity Italian white no favours and yet again emphasised to us that pairing this grape successfully with spicy food can vary dramatically. 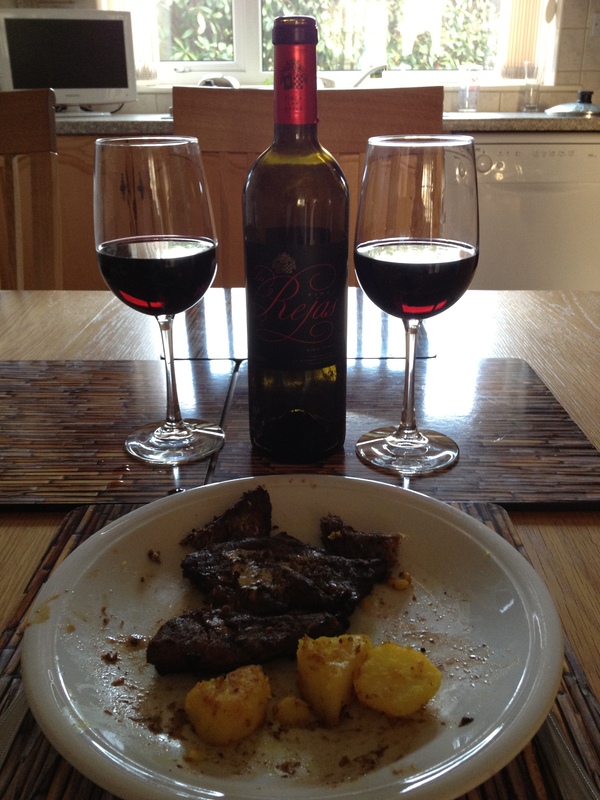 We switched to red and opened a bottle of Finca Las Rejas NV, a medium-bodied Spanish Tempranillo from the Sunday Times Wine Club. This Crianza-style Rioja delivered red fruits and a spicy, smooth vanilla creaminess and was much better with the chops. However, we didn’t think this was one of Madhur’s finest recipes. We were out and about during the day so bought one of Tesco’s Simply Cook Garlic and Herb Spatchcock Chickens for a quick and easy meal. The chicken was flavoured with lemon butter and parsley and whilst it was lovely and moist, like many convenience foods, they look better in the packet than they taste. In this case, we felt the flavourings were very bland and the overall effect was little different to eating plain roast chicken. We opened a bottle of Campanula Pinot Grigio 2010, a Hungarian white from the Sunday Times Wine Club. We chose this before we had tasted the chicken, anticipating more lemon flavours in the meal. The wine was true to its description having lemon and apple flavours and crisp acidity. A good enough wine, but the pairing with the food was only fair. As a footnote, we used the leftover chicken the next day in a spicy salad recipe from Best Chicken Recipes and it was considerably better. Our son Andrew and daughter-in-law Steph came for a meal this evening. One of Andrew’s old favourites is Chicken Tetrazzini (Pasta with Chicken in a Creamy Mushroom Sauce) from the Nice and Easy Cookbook (CLB). However, we fancied trying the Spaghetti Tetrazzini recipe from Jamie’s Italian. After the last few food and wine experiences, we were hoping for something better and Jamie’s recipe was excellent. It had porcini mushrooms as well as common ones and was more subtle than the Nice and Easy recipe. We paired the pasta with a reliable Sicilian white – Il Papavero 2010 from the Sunday Times Wine Club and last enjoyed with a Chicken Tagine (see 22nd Jan 2012). The wine was fresh and smooth and this time we agreed that the pairing accentuated its citrus lemon, apple and melon flavours. A good match. 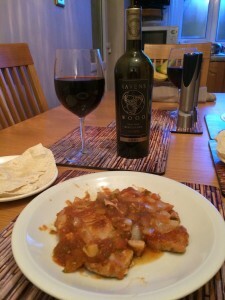 We had the remainder of last week’s Chicken and Green Olive Tagine from the freezer (see 15th Jan 2012) and enjoyed a slightly more intensely-flavoured dish this evening. We decided on a bottle of Il Papavero Pinot Grigio 2010, a Sicilian white from the Sunday Times Wine Club. (See 22 May 2011 and 20 March 2011 for pairings with the 2009 vintage). We tasted apples, pears with a fresh citrussy grapefruit bite. It was good with the Tagine. We cooked an Indian meal – Turkari Molee, which is Lamb and Coconut Curry and accompanied it with Turkari Aloo (Curried Potatoes), Naan and Poppadums. Both recipes are from Supercook. 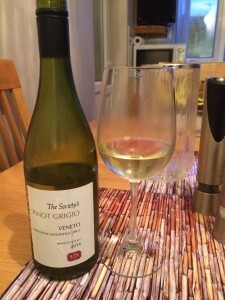 We toyed between a red or a white wine and initially opened a bottle of Sally’s Pinot Grigio 2009 an Australian white from the Sunday Times Wine Club. Very fruity, fresh and a great aperitif, but not good with the curry, so we switched to red. We have previously enjoyed La Cantera Reserva 2001 with Indian Lamb Shanks (see 28th October 2011), so we opened a bottle. Whilst this medium-bodied, Spanish, Garnacha-based blend from the Sunday Times Wine Club delivered red fruits, plums, spices and vanilla, it’s flavours seemed to be somewhat dulled by the food. We’ll have to think again when we have the leftovers. A Sicilian Pinot Grigio or a Kiwi Sauvignon with Jamie’s Empire Chicken? We’ve been watching Jamie’s Great Britain over the last few weeks and couldn’t wait to try his Empire Roast Chicken recipe, available on the C4 website . Roast chicken marinated in Indian spices, with a spicy gravy and Bombay-style roast potatoes. Jamie has tried to fuse the best of British and Indian cuisine. It was a very enjoyable meal and we accompanied it with a bottle of Barone Paladino Pinot Grigio 2009, a Sicilian white from Sunday Times Wine Club. This is a richer, spicier style of Pinot Grigio and we thought the citrus and lemon flavours went well with the chicken. 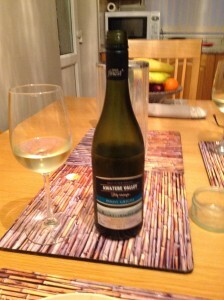 However, we also had another wine we wanted to taste with the meal – Brancott Marlborough Sauvignon Blanc 2010, a New Zealand white from Costco. This was zesty, with gooseberry flavours and rich tropical fruit. Another good match with the chicken. Posted on December 17, 2011 December 20, 2011 Categories Full & Ripe, White WineTags Chicken, Costco, Indian, Italian White, Jamie Oliver, New Zealand White, Pinot Grigio, Sauvignon blanc, Sunday Times Wine ClubLeave a comment on A Sicilian Pinot Grigio or a Kiwi Sauvignon with Jamie’s Empire Chicken?